DEV DAY is an annual developer event organized by Turbine Kreuzberg for, with and by developers. It started off in 2014 in Portugal at Turbine Kreuzberg's Faro offices and has become a full-grown annual conference that takes place simultaneously in Berlin and Faro. This year, DEV DAY'19 will be an action packed day filled with 12 talks, 2 panel discussions, a coding challenge and networking with fellow developers with diverse backgrounds, expertise and ages. We welcome everyone to take part and exchange knowledge. This year's conference headline is: »Coding & Beyond: Inspiring the Future of Development« to address a bigger picture: Where will tomorrow take software development? All speakers have been advised to include a demo or live coding sessions into their talks so you can take away a maximum of valuable insights! This year's talks will cover a broad range of topics, starting with machine learning, covering decentralized apps up to audio production on Unity and insights into time series data analytics. 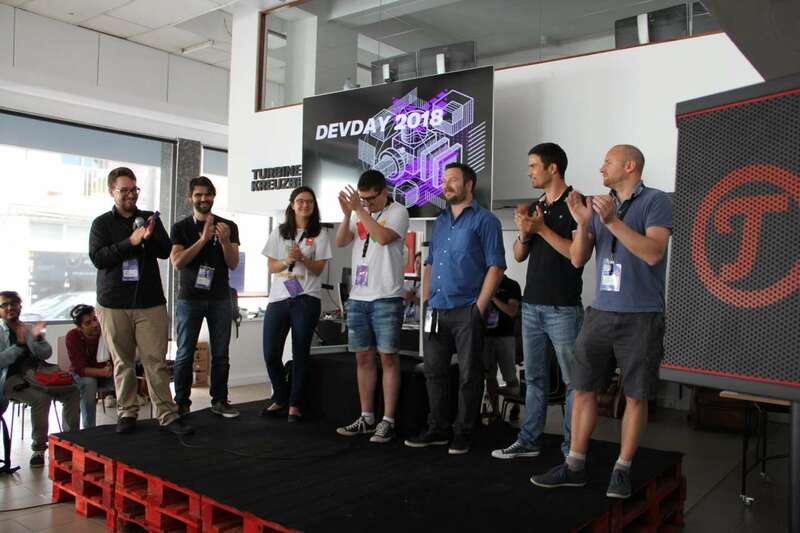 DEV DAY'19 in Faro is an event free of charge for you but we kindly ask you to register here. We've decided to offer a special ticket option that allows you to donate as much money as you like to the open source projects that we are supporting this year. We're collecting these contributions and donate them equally to the open source projects. If you're using any of these projects or feel like they could need your support, make sure to add this ticket option to your eventbrite cart. Thank you very much for your contribution! * The Open Streetmap logo is a trademark of the OpenStreetMap Foundation. The Free Software Foundation logo is a trademark of the Free Software Foundation, a nonprofit with a worldwide mission to promote computer user freedom. The NumFOCUS logo is a trademark of NumFOCUS, who promote open practices in research, data, and scientific computing by serving as a fiscal sponsor for open source projects and organizing community-driven educational programs. Turbine Kreuzberg and the DEV DAY'19 event are not endorsed by or affiliated with the OpenStreetMap Foundation, the Free Software Foundation or NumFOCUS in any way. This year great partners are supporting DEV DAY'19 and they will also dispatch their evangelists to be present at DEV DAY in Berlin! Come and meet them in person and ask all the questions you always wanted to ask! Twilio is a cloud communications platform as a service (CPaaS) company based in San Francisco. Twilio has democratized communications channels like voice, text, chat, and video by virtualizing the world’s telecommunications infrastructure through APIs that are simple enough for any developer to use, yet robust enough to power the world’s most demanding applications. Their mission is to fuel the future of communications. Jolocom is developing a solution which provides users with a decentralised infrastructure for self sovereign identity based on hierarchically deterministic keys (HD keys) generated, provisioned and controlled by the users themselves. They're the creators of the Jolocom Identity Protocol, an open source protocol for people and smart agents to autonomously create and interact with digital, self-sovereign, interoperable identities. Blockstack is a new internet for decentralized apps that you access through the Blockstack Browser and where users own their data. They provide key tools and infrastructure to developers enabling decentralized storage and decentralized authentication & identity.